When we think about our favorite performers, so many burning questions come to mind. What do they like to do for fun? Where do they like to shop? Who are their favorite artists? What food do they love? Would we be BFFs? You think about all of these things, too, right?! Of course you do! So, we decided we wanted some answers and, luckily, those performers were more than happy to indulge us by sharing their road diaries. Emily Koch plays Elphaba in the touring production of Wicked, and she told us that she's addicted to Sriracha, loves The Phantom of the Opera and can't get enough Chipotle. Find out what else makes Koch tick below! 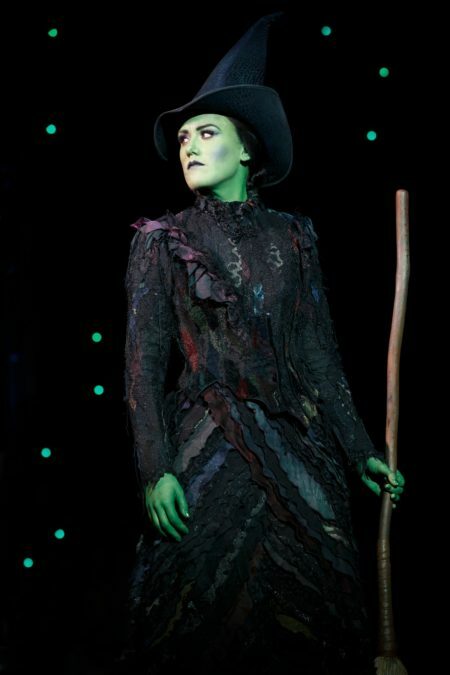 I admire Elphaba's constant resilience, her passion, and her fervent sense of self even in the face of adversity. It's a really cool experience to look up to a character that I'm playing. It's inspiring. My roommates and my New York routines, like going and getting my favorite coffee and heading into Riverside Park for a morning walk, and then heading to my favorite restaurant Peacefood Cafe for lunch! Well this is going to be the corniest answer of the year but, I love EVERYTHING about musical theatre. I think it's the perfect storm of art. Who doesn't want to express themselves through spoken word, song, and dance?! Three outlets in one?! There is nothing better! Sutton Foster and Celia Keenan-Bolger. I think they are both incredible performers and I really admire their ability to bounce between different art forms constantly. Try as my amazing teachers might, no one can really prepare you for how to balance your own life and performing each night. It's such a personal journey to discover what you need to give the best performance possible but also not make your whole life revolve around the show because that will just make you crazy. Definitely something I am constantly working on and discovering. Do not apologize for going after what you want to do. It's far braver to admit you love and are going for something than to hide it and pretend it doesn't matter to you. My humidifier and my bottle of Sriracha. The Phantom of the Opera. I saw it when I was like four years old and was FLOORED. I try not to be superstitious and have certain things I do, but I do my vocal warm up and I like to feel open and happy before going on stage, so talking with people and laughing is usually what I'm doing. Well I'll admit, it used to be Wicked… But now that I have my Wicked fix, I can often be caught singing the male songs from Once. I hope someone who reads this remembers this show but Pepper Ann from Pepper Ann! How to take care of myself, truly. You learn really fast what you absolutely need and what is just extra "stuff," and it's a lot less stuff than you think. Dot in Sunday in the Park with George. Oh man, I sleep in extra late and have been known to get Chipotle. With EXTRA guac.